PRODUCT: SIEVERT ESK2-30 SOLDERING IRON KIT, WITH #3486-47 SIEVERT PRO 86 HANDLE, 2955-01 SOLDERING BURNER, 7081-21 WIND SHIELD, STAND, #7020-70 13 OZ. POINTED COPPER BIT, 25 FOOT UL LISTED HOSE, 3062-93 UL HAND TIGHTENED REGULATOR, FLINT STRIKER. PRICE/KIT.. 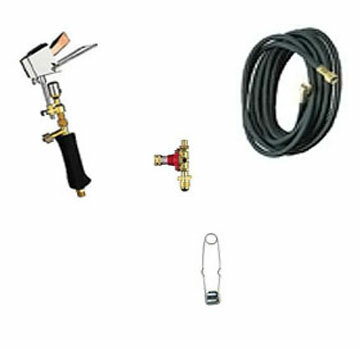 DESCRIPTION: PROPANE SOLDERING KIT INCLUDES #3486-47 SIEVERT PRO 86 HANDLE, 2955-01 SOLDERING BURNER, 7081-21 WIND SHIELD, STAND, #7020-70 13 OZ. POINTED COPPER BIT, 25' UL LISTED HOSE, 3062-93 UL HAND TIGHTENED REGULATOR, FLINT STRIKER. FEATURES: Encased flame, lightweight construction, fast heating burner, interchangeable copper bits. SIEVERT #3062-93, LP GAS ADJUSTABLE PRESSURE REGULATOR, 28-57 PSI, UL LISTED, WITH POL FITTING AND 9/16-18 LEFT HAND MPT HOSE OUTLET. PRICE/EACH.